The concerts are not yet listed on their website. Thanks to Red for the information! This entry was posted in Concerts, South America on April 4, 2012 by Olivier Bruchez. 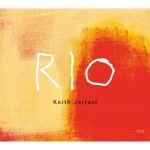 Next album, “Rio”, to be released on October 25, 2011? Keith Jarrett’s next album, a recording of the April 9, 2011 solo concert in Rio de Janeiro, is now listed on Amazon (US, UK, and France). It will apparently be released on October 25, 2011 and will simply be called “Rio”. It is also interesting to note that it is going to be a 2-CD set (meaning that it will include the entire concert?). Thanks to Olivier for this information! Update (August 29, 2011). According to Amazon Germany, “Rio” will be released on October 1, 2011. Thanks to Jonas for letting me know! Update (September 1, 2011). Amazon now has the cover art for “Rio”. Also, the release date for the US is apparently October 18, 2011. Update (September 30, 2011). The release dates for “Rio” on Amazon are now: October 19 (Japan), October 25 (France), November 4 (Germany), November 7 (UK), and November 8 (US). This entry was posted in Concerts, Releases, South America on August 17, 2011 by Olivier Bruchez. According to a post by Steve Lake on JazzCorner.com, the April 9, 2011 solo concert in Rio de Janeiro will be released in 2011 (“sometime this autumn”, according to Steve). Thanks to Nick for the information! This entry was posted in Concerts, Releases, South America on May 22, 2011 by Olivier Bruchez. Thanks to Anja, Fahim, Jacques, John, Marcos, and Mikkel for sending me information about these concerts. Update (March 12, 2011). Tickets for the concerts in Paris and Antibes Juan-les-Pins will go on sale on March 14 and April 6 respectively. This entry was posted in Concerts, Europe, South America on March 8, 2011 by Olivier Bruchez.